﻿ Using Stones for Personal Growth. Chrysocolla or Magnesite: Belonging. Chrysocolla is a relatively soft, opaque, greenish-blue stone composed of hydrous copper silicate. It forms in massive, compact, grape-like aggregates, and is often found with azurite and malachite as a byproduct of copper mining. Chrysocolla can easily be confused with turquoise, but it has the property of sticking to the tongue, which can help to identify it. Deposits are found in Chile, Russia, the U.S. and Zaire. 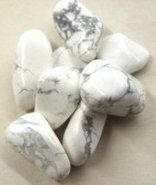 Magnesite is a white, opaque or slightly translucent stone that has thin black or gray lines on the surface. It is composed of magnesium carbonate and has a vitreous to dull luster. Magnesite is found in Austria, Sweden, Italy, Norway, Brazil, China and USA. Chrysocolla (as well as Magnesite) acts on the Inner Being to strengthen Belonging. Belonging here means association, not ownership, since it is belonging with, not belonging to. Belonging is having a personal involvement with a person, group, association, project or cause. It is forming an emotional attachment in which you fit in and feel a sense of familiarity with the other person or people in a group. A strong sense of belonging comes from operating your life according to the principle of freedom of association, which is a basic human right. This is the freedom to control your own emotional attachments. It is the freedom to choose the extent to which you want to fit in or belong with a particular group that is willing to have you as part of it. It is the right to choose what things you want to be part of, who you want to have relationships with, and how you want to fit in with any relationships you have, including friendships, family, associations, society, and the world in general. It also includes the right to choose to not be a part of something you don't want to be involved in. Freedom of association gives you the right to decide where to fit in, as well as the right to resist when others try to tell you how to fit in or who to associate with. It empowers you to make your own decisions about where to fit in. It is entirely your choice as long as you do it with the permission of those you want to belong with, since you need their permission to be in their personal space. In order to fully claim this right for yourself, you must not be afraid to stand up to people who try to make you belong where you don't want to belong, or try to keep you from belonging with others who want you as part of their group. Every human right has two sides to it, namely the right as it applies to you, and the right as you must let it apply to everyone else. The other side of this right is the obligation to allow others their freedom of association, and not interfere with how they choose to fit into society in general or with certain people in particular. It is the obligation to let others control their own personal space and let go when someone decides to fit in or belong with a group or situation that does not suit you. Keep in mind that you do not have the right to restrict people by telling them who to associate with or where to fit in. If you understand this, you also understand that you have the obligation to let go when someone decides to fit in or belong with a group or situation that does not suit you. When you allow people to choose their own associations, you also allow them to be empowered. If you don't have a good grasp of the principle of freedom of association, you tend to back away from claiming your own right to belong. This can make you feel isolated, lonely, and afraid of being rejected. In addition, if you don't believe people have the right to choose where to belong, you tend to group people into those that belong and those that don't, and you discriminate against those you think don't belong. You interfere with their right to belong, and you make them feel like outsiders by creating an "us versus them" situation. To strengthen your feeling of belonging, become more aware that everyone has the right to think as he wants, no matter what his mind set. Develop a tolerance for individual thought, a tolerance for people who think differently and have different attitudes from you. Once you acknowledge that all the different philosophies and outlooks held by people have a right to exist, you also know you must have the freedom to associate with like-minded people whose attitudes and philosophy are similar to yours. You will always be happiest associating with people who are like you, because you will feel you can really get involved and belong with them. Your sense of belonging is also enhanced when you learn to use people's energy with care so that you don't harm them. Develop your awareness of the difference between what is reasonable to ask of people, and what is burdensome to ask. This will help you know how much you can lean on someone without taking advantage of him, and without wasting his energy unnecessarily. And it allows you to be dependent upon him without being a burden. If you make unreasonable demands of your friends, they feel used, and that isolates you from them and lowers your sense of belonging. Another key to belonging is to practice being nurturing toward those you care about. Learn how to promote their development and figure out what it takes for each person to thrive. To achieve this, develop a strong desire to see your favorite people flourish and do well, and be willing to put energy into helping them reach their maximum potential. By helping your favorite people thrive you strengthen your connection to them as well as your feeling of belonging with them. By acknowledging that it is a basic human right to choose how to fit in or belong in this world, you not only strengthen your own ability to feel a sense of belonging or "being part of", but you also increase your capacity for letting others fit in where they want.